Cruise Ship Disaster Puts Focus On Safety Concerns Some of the survivors of last week's shipwreck off the Italian coast described the rescue effort as chaotic and disorganized. A maritime workers union called the disaster a "wake-up call" highlighting long-standing safety concerns — like ships getting too large to evacuate quickly — and lax regulation. The dramatic Costa Concordia accident off the coast of Italy is calling attention to the regulation of the cruise line industry. Experts say there are plenty of rules, but enforcement can be spotty. Some of the survivors of last week's disaster described the rescue effort as chaotic and disorganized. The crew had not yet conducted a required emergency drill during the cruise. Dan Brehm, a lieutenant commander at the U.S. Coast Guard's Cruise Ship National Center of Expertise, says whatever might have happened on the Costa Concordia, safety regulations are very clear. "Wherever that ship operates, it has to be in compliance with international regulations and any domestic laws that apply, depending on where it's operating," he says. The Coast Guard is the enforcement agency for U.S.-based ships, and Brehm says it also enforces the rules on any international ship that enters a U.S. port. "Not only do the crews themselves have to inspect their own equipment [periodically], but they have to undergo a weekly emergency drill, and the crew has to participate in these drills at least once a month. Additionally, the company has to do an audit of the ship once a year," he says. An arm of the United Nations called the International Maritime Organization makes these rules. They detail everything from where and how many life vests ought to be stowed, to the instruction on evacuation procedures that passengers must receive within 24 hours of boarding. But there are those who say the industry and its regulators fall short. Nautilus International, a maritime workers union, called last week's shipwreck a "wake-up call" highlighting long-standing safety concerns and what it sees as lax regulation. For example, the union says ships have been allowed to get too large to evacuate quickly. Kendall Carver founded another group called the International Cruise Victims Association and is a vocal critic of the industry. "They're not policed," he says. Carver's adult daughter, Merrian, disappeared from a cruise ship in 2004. Neither the crew nor the cruise company notified law enforcement of her disappearance. Her unsolved case inspired Congress to pass a law requiring reporting of crimes on cruise lines. Carver says as he investigated his daughter's case, he uncovered a shadowy underground where cruise lines escape regulatory scrutiny. 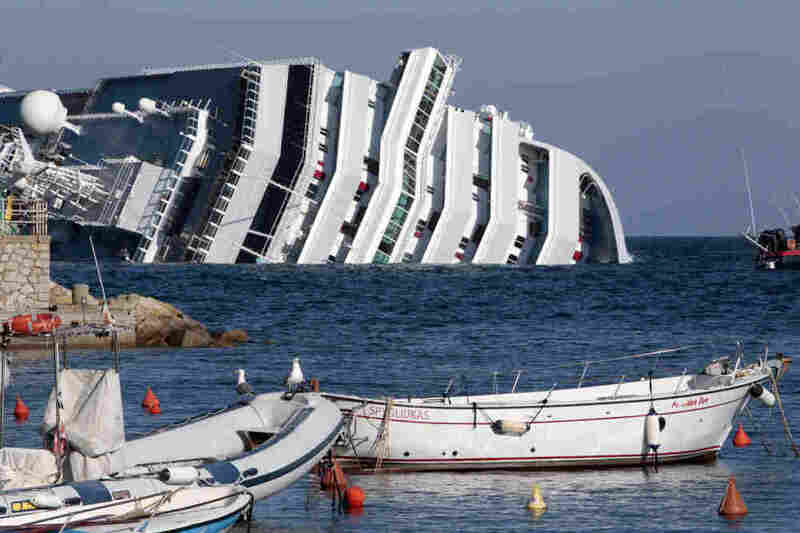 That's why, he says, allegations that the Costa Concordia did not follow protocol do not come as a shock. "I'm not terribly surprised. I am sure that is not the first time that ship has deviated off course," he says. Carver says a simple GPS system should have set off alarms, and that the accident raises another issue: Cruise lines are hiring from countries where labor is cheap, and they don't do enough safety training. "That crew, they weren't even speaking the same language as the passengers," he says. Carver says cruise lines also hire high-ranking officials from the FBI or the Coast Guard, and the result is a too-cozy relationship between the regulators and the industry. Peter Wild, the managing director of a London consultancy to the cruise line industry, does not agree with those charges. He says safety precautions are followed, if nothing else because they are good business policy. "The last thing the industry wants is a disaster like this," Wild says, "so they make tremendous efforts to avoid any such events." He notes that cruise lines have a better record than airlines, in terms of deaths per million passengers. "The fact of the matter is that almost all of the 4,000 people onboard the ship got away ... safely. Sadly, some didn't. But in the scale of the event, the evacuation was achieved," Wild says. The industry will work hard, he says, to learn from its mistakes.